(Bloomberg Opinion) -- The biggest company in the world is about to have a bond deal to match. Saudi Aramco’s new dollar-denominated issue looks like it will be at least $10 billion, but it is easy to see how it could end up much bigger. 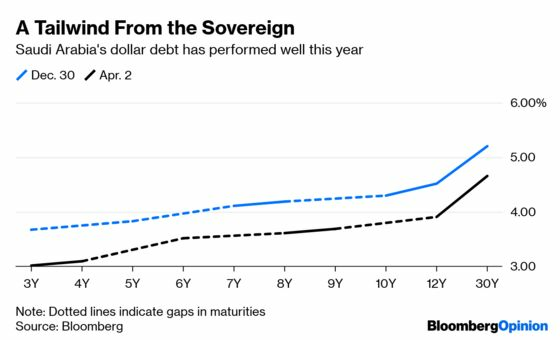 The record to beat is that of the sovereign — Saudi Arabia wrapped the largest-ever first time issue in October 2016 with a multi-tranche $17.5 billion deal. Now that the prospectus has landed, revealing a great many things we did not know about the oil giant and the Saudi kingdom, potential investors can try to figure out what price they want to pay. But as we’re in new territory with this deal, this is not a straightforward matter. You can only come at it from a number of different angles. The deal will probably come at a premium to the sovereign, which, usefully for Aramco, has been performing well this year. Consider the A+ assigned by the major rating companies. This is the same as the sovereign’s grade. You can see why they’re on the same plane — 70 percent of the Kingdom's budget revenues come from Aramco. The ceiling to the oil company’s rating stems from risks connected to the government’s control over production and dividends. A cut in Aramco’s tax rate to 50 percent from 85 percent was no doubt intended to make this deal more palatable to investors. Even so, there’s still room for them to be wary about the strength of their claims on future revenues. Even though Aramco is likely to offer a decent premium to the sovereign, that may not last. It’s like the difference between an operating and a holding company — investors might prefer to have a more direct claim on the oil company’s assets. 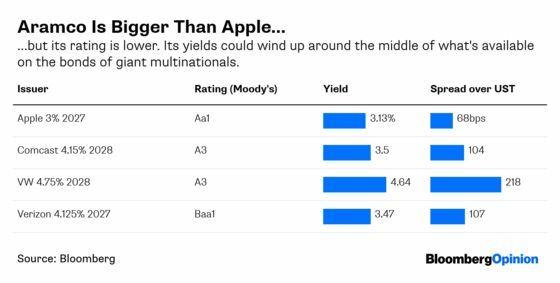 A look at comparably-rated large multinationals can help fill out a picture on what the yield could be. 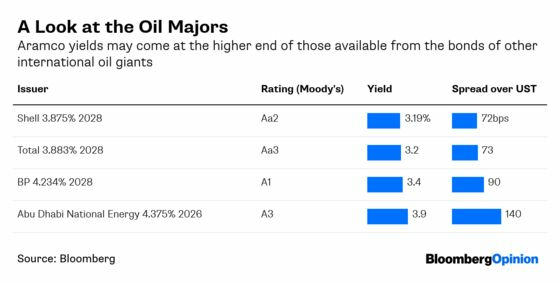 As can this snapshot of the yields available from other oil majors. The recent performance on the sovereign’s dollar-denominated syndicated securities also give a clue on market sentiment on the kingdom. 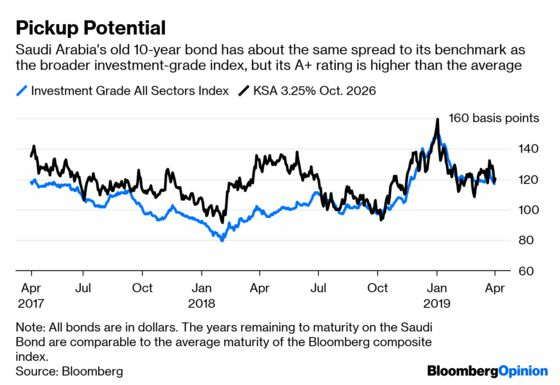 It would seem that any broader political concerns about the Saudis don’t add up to much in the bond market. The bond sale’s proceeds will fund Aramco’s purchase of Sabic, though of course it’s really a precursor to the long-awaited IPO. It’s fair enough to ask why a company with so much money rolling in really needs more, but as my colleague Matt Levine points out, it’s just getting some future money sooner. And its a good way to get investors comfortable with the name. 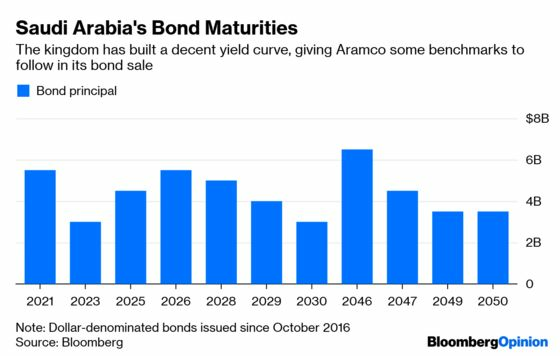 The Aramco bond sale should go well. The premium to existing comparable securities should be decent. Investors are on the hunt for yield. And the new issues will go straight into the bond indexes that many of them use as a benchmark. This makes a blockbuster as close to a self-fulfilling prophecy as its gets.